A family’s casual stroll along a bike path changed dramatically into a crisis when the stroller carrying the five month old baby girl started to roll down the levee moving towards the Sacramento River. 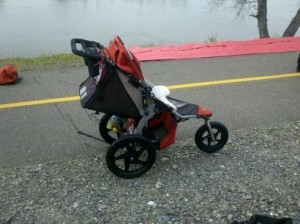 The mom caught the stroller just in time and the two were later rescued by firefighters. 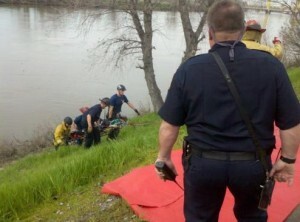 Witnesses say that at around 3:00 pm on Wednesday afternoon, a woman and her fiancé were walking along the bike path at R and Front Street along the Sacramento River. They were pushing the stroller carrying their baby girl when suddenly the woman lost control of the stroller. It began rolling down the side of the levee, dangerously getting closer to the river. The couple ran behind it and just as it hit the water, the women caught hold of it. In the attempt to save her daughter the mother, injured her ankle and was not able to climb up. Capt. Jonathan Burgess, fire department spokesman said that the fire department special rescue team arrived at the scene and used a pulley system and a basket to rescue the mother. She was then taken to UC Davis Medical Center for treatment. The baby too fortunately did not incur any major injuries. She had minor scrapes and was pulled out of the knee deep water by the rescue team. The mom was pushing a Bob Stroller Strides jogger, which actually has a wrist strap and handbrake to prevent such incidences. Alexis Stewart Welcomes A Baby Girl!